By Leo Tolstoy, originally published in 1869, Penguin Classics Deluxe Edition, 1408 pages. I can’t seem to move on without finishing up my thoughts on War and Peace. There is so much in this book, so many quotes that provoke thought that I wanted to record some of them here. But first, a few general comments. The members of my book club complained that there were too many character and plot loose ends. I think that is because throughout the work, Tolstoy was trying to imitate life, real life. And in real life people form new relationships and move on. There isn’t always closure and there is often disappointment. Because of this, War and Peace can be read in several ways. It can be read merely for its story. It can be read for Tolstoy’s philosophy regarding historical science. 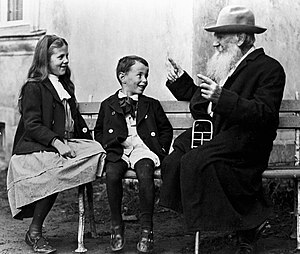 Or, it can be read for the many details of human nature and interaction that Tolstoy provides. Clearly Tolstoy understood the Russian aristocracy and the politics of the drawing room. I think it’s interesting to ponder how the drawing room of the 1800s and the social norms observed there can still be found to some extent, though somewhat altered, in places of social interaction today—such as the office. If you think about it, for many of the aristocrats of the 1800s who did not have to work and therefore did not have the cubical madness we embrace today, the drawing room very well may have been their equivalent of our office. Do I like Tolstoy? Well, yes and no. I don’t like that Tolstoy is trying to push his agenda on me. Every writer does this, of course, but Tolstoy has a heavier hand than I like. One book club member said that after Tolstoy, she didn’t think she would read any more Russian authors. I was stunned. What a statement and from a world traveler no less. Are all Russians the same? Everyone of them? Now, yesterday, and forever? What????? Sorry, I’m going to have to digress here. These are the kinds of statements I’m having to make lately: Not all Russians are the same. The USSR is no longer in existence. The USSR consisted of 15 republics that dissolved in 1991, not in 1989 when the Wall fell. The Wall was in Germany. Russia was one of those republics. Russians are not all atheists! There are many deeply religious Russians. Notice the incredible eastern Orthodox churches. Russians do smile, and they do smile in public. Yes, yes, I know. We were all victims of Cold War propaganda, but we don’t have to continue to be victims. We can open our eyes! There are good and bad people everywhere. We are all a mix. Ok, well that said. I like (love) Tolstoy—in parts. I love the way he captures little bits of human nature that ring so true to us that they remain relevant after more than 100 years and across thousands of miles. The following are some examples of what I’m talking about. “On the way to his sister’s room, in the gallery connecting the two parts of the house, Prince Andrey came across Mademoiselle Bourienne who smiled sweetly at him. It was the third time that day that she had happened on him in out-of-the-way passages, always with a nice beaming smile on her face. Later when Pierre is trying to ask Helene to marry him, he mentions a line that he must cross and his inability to cross it. Well anyway, I could go on and on, and maybe I will at some point later. The book is a hefty tome, no doubt about that. I can’t believe it would ever be assigned to a high school student. That seems preposterous and a way to kill a love of literature in anyone. But if read without a deadline and for pure interest in the subject, War and Peace has a lot to offer. By Leo Tolstoy; first published in 1869; Penguin Classics Deluxe Edition; 1408 pages (Notes begin on page 1359). Around page 1350, I began to wonder, just what is Tolstoy trying to do here? Obviously an intelligent guy, definitely no radical, what is going on with the structure of this book???? It seems odd to put a spoiler alert on a book that was published more than 100 years ago, but still, I realize many people haven’t read it and I don’t want to interfere with Tolstoy’s intent by saying: hey watch out for this, especially for those puritans out there who want to experience the work as it was meant to be experienced. If, however, you are one of those “walk on the wild side” kind of people, here’s what I think is going on. Tolstoy’s point is that you can look at history in these two ways and these two ways lead to conclusions that are at odds with each other. In the first way, when examining history as though it depends on individual leaders and the multitude of causes performed by individuals, the concept of free will comes under examination. Individuals have free will, they choose their actions, and history results. In the second way, when you look at humanity in more general terms as a unit and think that we are all affected by the natural environment in which we live. We are all affected by space and by time, by our environments, etc. And all of these situational constraints keep us from ever truly being free. For example, we have to eat; therefore, we may be compelled to do things to satisfy this need. The more needs we have to fulfill, the less free we are. Tolstoy seems to be saying that historians of his time hesitate to examine this phenomenon of historical laws, in this case the struggle between the law of necessity and that of free will. If you read Part II of the Epilogue, you’ll find this discussion. Reading this before reading the whole book from the beginning is what I suggest to get the most out of Tolstoy’s argument. It won’t ruin the plot for you at all. But it may rob you of that “ah ha” moment—which if you think about it, I am robbing you of right now. It is very interesting. Perhaps more interesting than any of the preceding pages. I think Tolstoy was trying to prove his point throughout his novel. By the time we get to the Epilogue, we see him pulling these strands together. In the final analysis, I believe that Tolstoy was saying that we are never completely free. We believe we are free, but by virtue of being alive and all the necessities that state of being brings about, we do not have the free will we think we do. I got the feeling he was saying freedom and necessity are in constant flux. And some people have their lives set up so that they have fewer needs and greater freedom, whereas others don’t. I’m still in the process of reading War and Peace, but since I had such a hard time breaking into this novel and because my friends have had the same experience, I thought I would share some dos and don’ts that I have discovered. Be lazy like me and buy an Audible book version of this masterpiece. I tried that thinking that I could multitask while listening to the book. This was a big mistake. The tone and inflection of the reader put me off to such an extent that I started to hate the book and all of its characters. Give up…until you’ve reached page 250. If you don’t like the book by page 250, you probably won’t, so it’s safe to stop at this point. As for myself, I was very interested in the book by page 100. I enjoy Tolstoy’s observations and interpretations of his character’s innermost thoughts and feelings. Go online and find a summary of the five families of this book, their members, and their relationships to each other. This is not cheating. Figuring out who’s who is the central challenge of this novel. It takes about 100 pages to nail it down. Make notes in the margins of your book. This could be hard with an eReader. Since my debacle with the Audiobook, I went back to the old style paper version. Whenever something interesting happens, I make a mark in the margin or underline the text. When I notice that one part of the book relates to another, I write the associated page numbers in the margins. This has helped immensely. Pay attention to when and what characters are speaking French versus Russian. I found it very interesting that while Russia is under attack by the French, its upper class snobbishly prefers to speak French—at home. Why wasn’t Russian good enough for them? Tolstoy even goes so far as to give one of his main Russian characters a French name: Pierre. Read this in the wintertime when it’s cold outside but there’s no snow and no snow sports. Accept that this is a really long work and pace yourself. I set myself a goal of reading 100 pages per week. Sometimes I read more, but I don’t allow myself to read fewer than 100 pages. That comes to 10 pages a day (on workdays) and 50 pages over the weekend. Read Part II of the Epilogue before reading anything else. This will set you up nicely for what is to come. By Leo Tolstoy; Translated by Anthony Briggs; Penguin Classics Deluxe Edition; @ 2005; originally published in 1869; first appeared in 1865–66; 1408 pages. War and Peace is known for its massiveness. 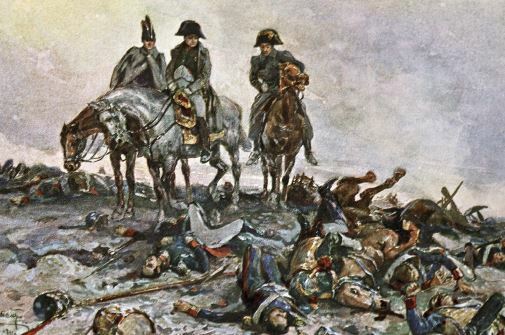 At 1,408 pages, reading War and Peace is like reading five novels. I don’t think Americans are typically required to read it. I wasn’t, not even at The University of Texas where I majored in Russian and East European Studies. So why read War and Peace now—since I’ve already escaped it once? It’s a common question. The members of my book club are asking themselves this too. What have we gotten ourselves into? Is this book still relevant? Is it worth it? Might this a book be better put off until old age when we have absolutely nothing better to do? Well, we say, it’s got to be a classic for a reason. It’s got to be good. Otherwise, it wouldn’t still be around. Right? Were it not for my persistent feelings of inadequacy which spring largely from possessing a Russian Studies degree and never having read this book, I might have been able to worm myself away. But, there it is. My personal and psychological makeup require that I drag my eyes over these 500,000 words. 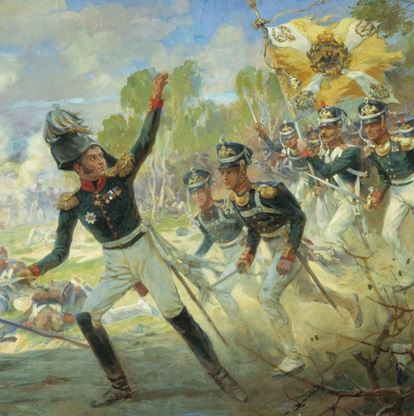 In 1865 War and Peace was released serially in the magazine The Russian Messenger and was titled The Year 1805. It wasn’t until 1869 that it was first published as a single unit. So the first readers weren’t handed a tome that resembles an attractive door stop. Instead, they were spoon fed bits of story. War and Peace must have been like a soap opera or a telenovella. Lots of pressing issues had to be on the Russian mind at this time. Twenty three million serfs had just been liberated (1861). This was a big change for Russian aristocracy. The price for labor had just gone up—way, way up! In effect 23 million people now had the full rights of free citizens, could finally marry without having to gain consent, could own property, and could create and own a business. And, they could buy land. Shocking. Simply shocking! So perhaps, part of the contemporaneous appeal of War and Peace was a nostalgia for the past. The time when the power and significance of Russian society was unshakable. There were ways one had to act. A foreign language one needed to know (French). People one needed to know. Connections one had to establish or face the consequences of a harsh life, or worse. And at the time of the book’s publication, we are 52 years from the 1917 revolution, which would change everything. Revolution seems to weak a term for what happened in 1917. But its the word we’ve got. So picture yourself on a cold night in 1865. Downton Abbey has yet to be written. Television has yet to be invented. In fact, I’m pretty sure you’re not living with electricity, and there’s no Facebook. The latest issue of The Russian Messenger has just arrived. Thank goodness for this Leo Tolstoy chap, you think to yourself in French. Wonder what ol’ Pierre has gotten up to now. How is Prince Andrey? Settle back into your easy chair and prepare to be transported back to an earlier time. You’re in the drawing room of the wealthy 40-year-old Anna Scherer in 1805. She goes by Annette. The year 1812 is still a ways off. There’s a prince who is having trouble with one of his sons, Anatole. The solution is simple. Marry the boy off. Annette will see that it’s done. By Leo Tolstoy (1828–1910); @ 46 pages. The Death of Ivan Ilych describes a death. The story begins as Ivan Ilych’s friends/associates learn of his death. They remember that he was a friendly guy liked by all, but really their immediate reaction was what effect Ivan’s death would have on them. What kind of promotion would they get now that Ivan Ilych’s position had been vacated? Then we are transported into a review of Ivan Ilych’s life, his major decisions, profession, and character. One thing I think is so interesting about reading Tolstoy is how observant he is of human nature and social interactions. Although Tolstoy lived more than 100 years ago, it makes no difference; his observations and insights into human relationships remain fresh and contemporary. Tolstoy himself was an interesting man. He fathered 13 children, became something of a religious fanatic, and according to my short story anthology, had a most annoying habit of running away from home. On one such adventure, he died in a railway station. One of my big complaints about my own culture is the seeming denial of the reality of death. When my family members started dropping off, I was woefully unprepared for the logistics. When my grandmother was on her death bed and I left work to be at her side for her final days, I was overwhelmed by the whole experience. We had been very close. She had spent more time with me growing up than perhaps anyone else, and I was beside myself with grief. I witnessed the deathbed experience again with my mother, this time for several months leading up to the event. It was a grueling ordeal, and I came away from both experiences with the idea that death happens when the body becomes so uninhabitable that the soul is forced out. Perhaps those who can let go of life easily have the easiest time with death, and perhaps those who are determined to live have the most pain. These are my impressions from direct experience. There are lots of religious ideas around death too, many of which I find very difficult to deal with during the event. My husband’s family views grief as a kind of heresy, a viewpoint I find incredibly inhumane. The short story, The Death of Ivan Ilych, leads us through these experiences and related happenings in great detail, physical, psychological, and social. Ivan Ilych did not marry the love of his life, we are not sure if he ever had one; instead, he married a woman who later became a shrew and failed to understand him, pity him, or even face his imminent death directly. I think I must seem preoccupied with death. And perhaps. A friend of mine passed away a couple of years ago. She had contracted a rare virus that attacks the heart and actually had a heart transplant. Her body rejected the transplant and a terrible skin irritation developed. Medicines then destroyed her liver and eventually she died. It was all quite gruesome. I can’t claim that I have done everything properly by any means. I reflect now and find so many errors and only hope to not make more. It seems to me as I reflect on my life at this point that things are of little value. My family put such a high value on collecting things, and I feel not a small amount of guilt for wanting to be rid of them and considering what experiences and travels their “worth” could bring. I’ve been obsessed for nearly two years with unburdening myself of things, and it seems that I am never happier than when I am traveling. These desires to see the world are in constant conflict with my desire to build a home, so that I have populated my backyard with lavender, strawberries, blueberries, blackberries, raspberries, spinach, mint, and arugula. I am fascinated with gardening even though gardening and traveling are forever at odds with each other. Tolstoy raises an interesting idea of correctness in living one’s life. Who decides what is correct? You? Someone else? At some point, I came to the conclusion that I wanted to live correctly—by my own definition. And this meant tearing down everything I had built up. What had been my dreams back when I dared to dream? And could I still accomplish them? Could I detach myself from all my self-created prisons and live? And what does living now mean to me? And is living worth anything without love? Finally Ivan Ilych has a realization that helps him die. It seems that Tolstoy touches all the bases surrounding death that I myself have experienced as a witness, all except one. Both my mother and grandmother hallucinated about people who were dead being in the room with them. I have read that others have had the same sorts of hallucinations. As for my poor dog who recently died, I could not bear to have her suffer in these ways. Maybe I did the wrong thing. There are some who believe the process of death is valuable and not to be denied. Her euthanasia was my selfishness. And what would I want for myself? I want not to lie on my deathbed and realize I got it all wrong. I would like to look back and think I that when I saw two paths that converged in the woods that I took the one less traveled. Finding that path and getting onto it is the trick. It’s around here somewhere. I know it is. I can almost see it. By Leo Tolstoy; Translated by Richard Pevear and Larissa Volokhonsky; @ 2000 by Penguin Classics; First appeared serially from 1875 to 1877; 817 pages. 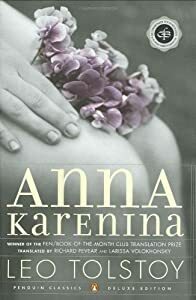 Anna Karenina is an 817-page study of the consequences of adultery. But it isn’t just about adultery; it’s also social commentary on everything from marriage, maternal love, having children, the education of the workers, farming practices, faith, and the moral implications of not actually working for a living. It’s about human relationships, love, birth, and death. Tolstoy forces us to look at Anna, the adulteress, as a person. He keeps us from judging her out of hand. He shows us the terrible consequences of choosing security over love and then again of choosing love over security. And he shows us all the jealousy, insecurity, and fickleness involved in human relationships. Anna Karenina is set against the backdrop of the Russian aristocracy in the 1800s. Tolstoy provides great insights into human nature that ring true even today, more than 100 years later. He explains that some adulterous liaisons were excused by society while others were not. The story is wonderfully crafted (for the most part—I felt like the ending was tacked on) and easy to read. None of the explicit details are given that modern readers are accustomed to. It’s all very classy. Tolstoy very subtly gets the point across on page 149, saying simply “…this desire had been satisfied.” With the romance out of the way early on, let the tortuous tale begin. 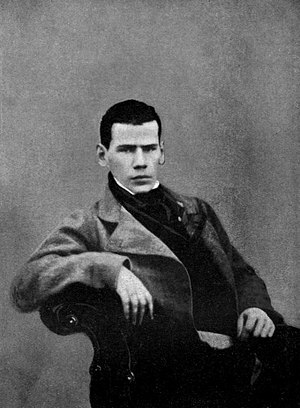 Count Leo Tolstoy was born in 1828 on the family estate of Yasnaya Polyana in the Tula province of Russia. He studied oriental languages and law but did not complete a degree. He faught in the Crimean War and afterwards wrote Sevastopol Sketches in 1855. He married at the age of 34 to Sofya Andreyevna Behrs, and together they had thirteen children. For much of his life, Tolstoy was active in efforts to educate and emancipate the serfs. His most well known novels are War and Peace (1869) and Anna Karinina (1877). Anna Karenina is a novel written in eight parts and told through the omniscient narrator. With this format, Tolstoy is able to explore the thoughts and motivations of all his characters. The story begins in Moscow, Russia. Prince Stepan Arkadyich Oblonsky’s affair with a former French governess has been found out by his wife, Dolly. Stepan’s married sister, Anna Karenina, who lives in St. Petersburg has been summoned to his house to console his wife and put their marriage back together. Meanwhile, Stepan has two friends, Konstantin Dmitrych Levin and Count Alexei Krillovich Vronsky, who are rival suitors for the same young lady, Kitty Tcherbatsky. Kitty is Dolly’s sister. (Confused? You won’t be once you get going.) To get it all started, Tolstoy puts Vronsky’s mother and Anna Karenina in the same train car to Moscow from Petersburg. The biggest problem for the western reader not used to Russian naming conventions is keeping track of the names and nicknames. If you can get that straight, this novel is smooth sailing. The translators, Richard Pevear and Larissa Volokhonsky, have done a fantastic job. 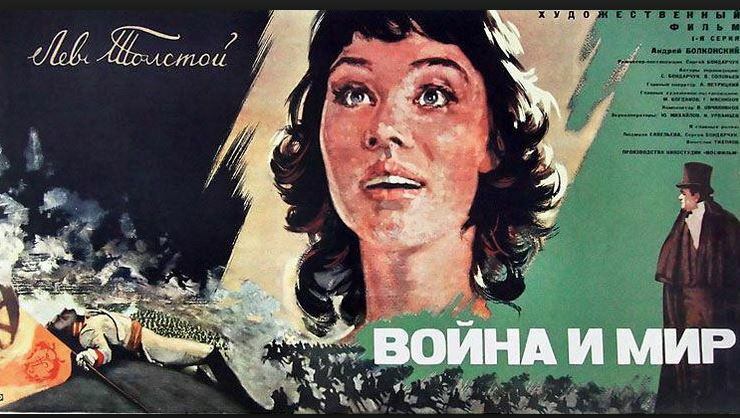 The first thing that struck me about the story was how unfair Stepan Arkadyich’s (Prince Oblonsky’s) view of his wife, Dolly, was. He could not be repentant that he, a thirty-four-year-old, handsome, amorous man, did not feel amorous with his wife, the mother of five living and two dead children, who was only a year younger than he. So this guy is older than his wife, and yet she is too old for him, now that she has “done her womanly duty” and given him seven children! It even seemed to him that she, a worn-out, aged, no longer beautiful woman, not remarkable for anything, simple, merely a kind mother of a family, ought in all fairness to be indulgent. He [Levin] knew she was there by the joy and fear that overwhelmed his heart. She stood at the other end of the rink, talking to a lady. There seemed to be nothing very special in her dress, nor in her pose; but for Levin she was as easy to recognize in a crowd as a rose among nettles. He stepped down, trying not to look long at her, as if she were the sun, yet he saw her, like the sun, even without looking. And however much the princess [Kitty’s mother] was assured that in our time young people themselves must settle their fate, she was unable to believe it, as she would have been unable to believe that in anyone’s time the best toys for five-year-old children would be loaded pistols. And yet, Kitty’s mother’s interference caused much grief. 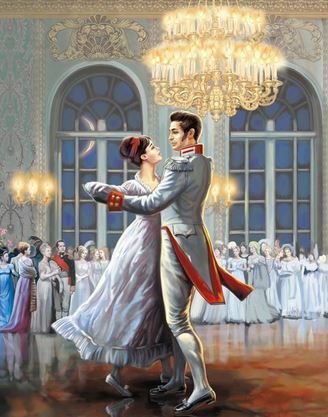 This novel turns around the love affair that develops between Anna Karenina and Count Vronsky. It must have been shocking reading indeed, for not only is Anna married to man with whom she has a son, it also seems that she might be older than Count Vronsky. Tolstoy illustrated for us from the beginning how Russian society viewed wives who were even slightly younger than their husbands—as unattractive throwaways who should be understanding of their diminishing status. I love how he pushes this social value when he sets up Anna with Vronsky. In his Petersburg world, all people were divided into two completely opposite sorts. One was the inferior sort: the banal, stupid, and above all, ridiculous people who believed that one husband should live with one wife, whom he has married in church, that a girl should be innocent, a woman modest, a man manly, temperate and firm, that one should raise children, earn one’s bread, pay one’s debts, and other such stupidities. This was an old-fashioned and ridiculous sort of people. But there was another sort of people, the real ones, to which they all belonged, and for whom one had, above all, to be elegant, handsome, magnanimous, bold, gay, to give oneself to every passion without blushing and laugh at everything else. For this there exists one means of loving conveniently, without hindrance—that is marriage…it’s as if you’re carrying a fardeau (burden) and doing something with your hands is only possible if the fardeau is tied to your back—and that is marriage. And I felt it once I got married. I suddenly had my hands free. But dragging this fardeau around without marriage—that will make your hands so full that you won’t be able to do anything. She [Anna] looked at him [her husband], so gaily, that no one who did not know her as her husband did could have noticed anything unnatural either in the sound or in the meaning of her words. But for him who knew her, who knew that when he went to bed five minutes late, she noticed it and asked the reason, who knew that she told him at once her every joy, happiness, or grief—for him it meant a great deal to see now that she did not want to notice his state or say a word about herself. He saw that the depth of her soul, formerly always open to him, was now closed to him. Anna’s husband, Alexei Alexandrovich, is twenty years older than she. He doesn’t seem capable of passionate love, but we see that he does love her. He would rather ignore the whole thing, save his reputation, and keep Anna as his wife. One can see that they are fundamentally a bad match. Alexei, with all his flaws, eventually becomes a sympathetic character, at least to me. He felt that he could not divert people’s hatred from himself, because the reason for that hatred was not that he was bad (then he could have tried to be better), but that he was shamefully and repulsively unhappy. For that, for the very fact that his heart was wounded, they would be merciless towards him; people would destroy him, as dogs kill a wounded dog howling with pain. As much as this story is about Anna Karenina and her love affair with Count Vronsky, it is also the story of Konstatin Dmitryich Levin and his love for Kitty Tcherbatsky. Levin seems to symbolize all that is good in men. He lives in the country, mows the grass with a scythe along with the muzhiks, and wants nothing more than to have a loving family. He is also a good tool for Tolstoy’s exploration of the pros and cons of the education of the muzhiks and the rise of a working class. One really big hole in the story, for me, was the absence of Levin’s reaction to Anna’s death. He has only met her once, but his awareness of Count Vronsky has been high throughout the story. He was charmed by Anna when he met her. It seems really odd that we don’t get Levin’s take on either Anna or Vronsky at the end of the story. Levin becomes consumed with the idea of death and the meaning of life. One can infer that this is one of the consequences from Anna’s death, but with the omniscient narrator, it seems that Tolstoy missed a big opportunity to draw the whole thing together. In infinite time, in the infinity of matter, in infinite space, a bubble-organism separates itself, and that bubble holds out for a while and then bursts, and that bubble is—me. But later, he has an epiphany. People must live for goodness, live for the soul, and that goodness is revealed by God. If the good has a cause, it is no longer the good; if it has a consequence—a reward—it is also not the good. Therefore the good is outside the chain of cause and effect. He also makes the argument that faith and love are outside the bounds of reason. Yes, what I know, I do not know by reason, it is given to me, it is revealed to me, and I know it by my heart, by faith in that main thing that the Church confesses. …faith in God, in the good, as the sole purpose of man. At over 800 pages, I was prepared to trudge through this novel. It was quite a relief to find it so engaging. I came away from this book wanting to throw out all my Russian novels and re-buy them as translated by Richard Pevear and Larissa Volokhonsky. They did a brilliant job. WordWabbit on All roads lead to India? Nish on All roads lead to India? kapilb on All roads lead to India?